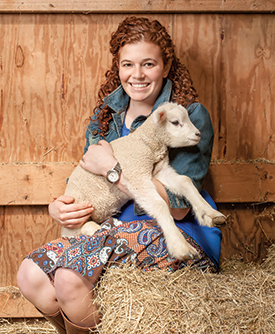 Whether she is photographing gun enthusiasts, shoveling horse manure, or socializing with the Amish, Rebecca Katzman '14 pursues part of her Kenyon education on country roads. And what a strange trip it has been. "My friends ask me why I didn't go abroad to study for a semester, but this is my abroad," she said. "I have it all here." The suburban St. Louis native steps out of the classroom cocoon and into the lives of Kenyon's neighbors through her involvement in the Rural Life Center, for which she is the student manager. Under the direction of Howard L. Sacks, professor of sociology, the center promotes education, scholarship, and public projects about rural life. Katzman's interactions with central Ohio residents-through internships, class projects, and independent study-have included working on a family farm, documenting Kenyon's local food system (as a model for other universities and colleges), buying tomatoes from Amish growers, photographing National Rifle Association members, and conducting oral history interviews with area residents. "A lot of these people have very different values from what I grew up with," Rebecca said. "I got myself into some interesting situations." During one memorable encounter, a local gun owner screamed at a loaded pistol that was lying on his kitchen counter, commanding it to "Kill! Kill!" When nothing happened, the man said calmly, "You see, guns don't kill people, people kill people." Recalled Katzman, "At first, I didn't know what was going on. I had never been that close to a gun before. But he made his point in a persuasive way." Another memorable experience-less unnerving-occurred under a warm setting sun last year when Katzman met with a dozen Amish farmers to discuss their participation in a local food cooperative. "Here I was, the only English person, sitting around a table with Amish men and women talking about the weather, local food, and their lives. Where else could that happen except at Kenyon College and Gambier, Ohio?" Katzman said. Katzman describes herself as the Rural Life Center's "jack-of-all-trades, doing whatever is needed." Her duties have included representing the center at conferences, planning events, designing the center's Web page, and compiling its archive. But her most important assets are the relationships she builds. "One thing that makes me good at this job is that I know a lot of people in the community," she said. "If a student or an event needs an auctioneer or a farmer, I can point them to the right person."